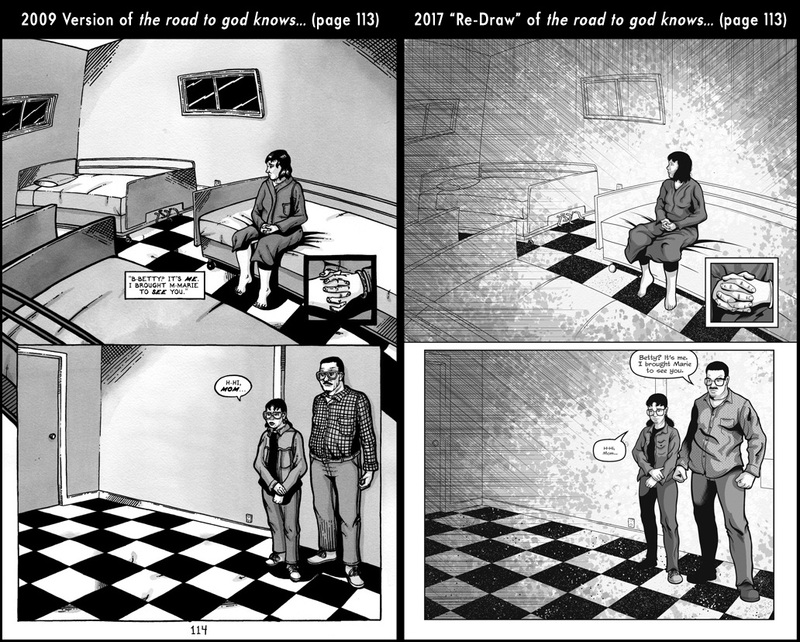 I wrote and drew a graphic novel titled the road to god knows..., which was published in 2009 after about four years of development. The story dealt with a young teenager's struggle to cope with her mom's schizophrenia. It's pretty autobiographical; to tell the story, I drew on a lot of my own experiences with my own mom's schizophrenia. It's fictional for all kinds of reasons, but the main one was that I wanted some distance from the story. 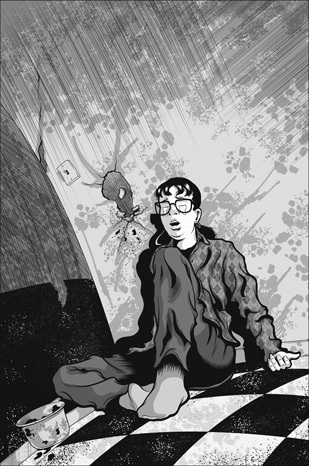 That said, the graphic novel was self-published and, art-wise, it's rough. I think there was a lot of heart to it, but my visual art was pretty weak. Figure-drawing problems, perspective problems, composition problems, value problems...you name a problem and road had it. In spades. I came to art very late and learning to draw is not the easiest thing in the world to do. Comics require a great deal of knowledge to do well. Those problems I mentioned? Well, you need everything to work together extremely well to create a comic. If that harmony isn't there...well, you get a pretty rough comic. And that certainly was an issue with road. But we learn by doing and I'm still proud, to this day, that I managed to do it. Rough spots and all. So I published it and it did as well as could be expected, especially given my art skills at the time. And though it still sold a bit every year, I stopped thinking about it. 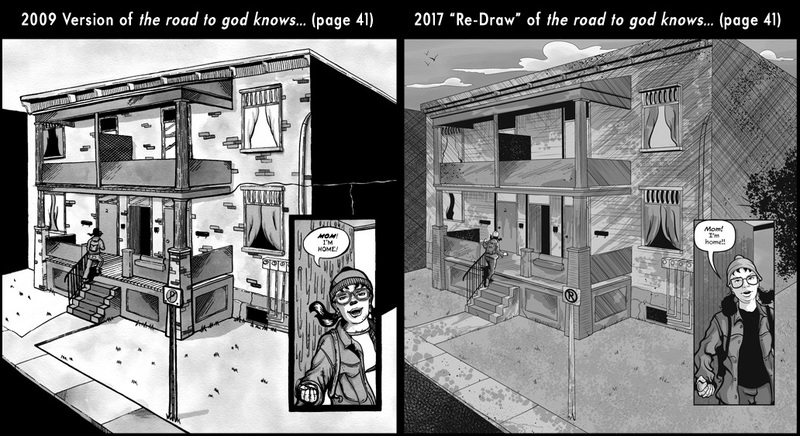 I moved on with my life, continued to make art and comics, continued to get stronger, but putting that rough first graphic novel behind me. Flash forward to April 2015 and I received an email out of the blue from a writer/director named Megan Durnford. She's working on a documentary film about the impact of parental mental illness and wanted to talk with me about road. To make a long story short, the film (titled I Am Still Your Child) was made (amazing!) and I was a part of it (shocking!). And it was made with empathy and sensitivity and deals with an issue that really isn't discussed much in public at all. I was (and am) very pleased to be included in the film. The making of the documentary led to an interesting situation. 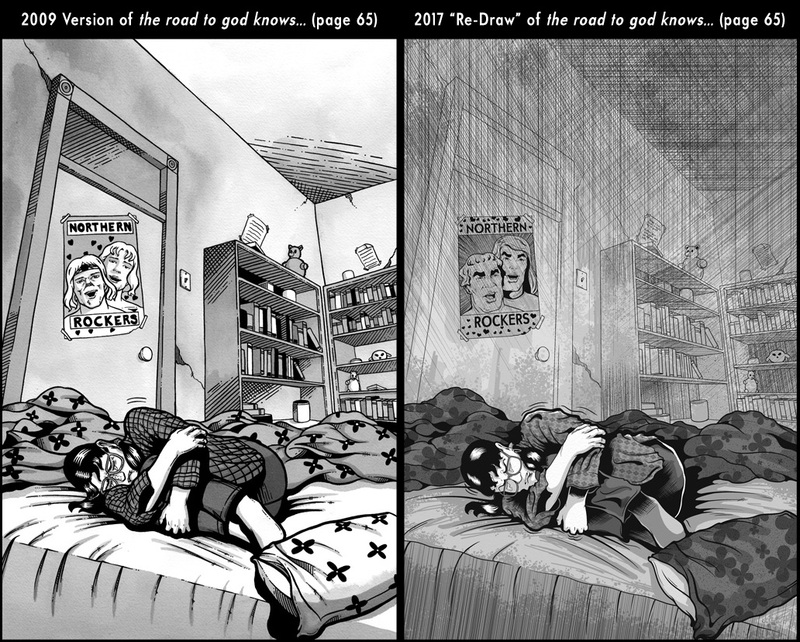 Megan wanted to use artwork from the road to god knows... in the documentary. And...that was not good. I hadn't looked at the art in a number of years and, when I revisited it, I was dismayed (maybe horrified would be a better word). The art was rough. Really, really rough. And it put me in a bind; I didn't want to have road represent where I am now. 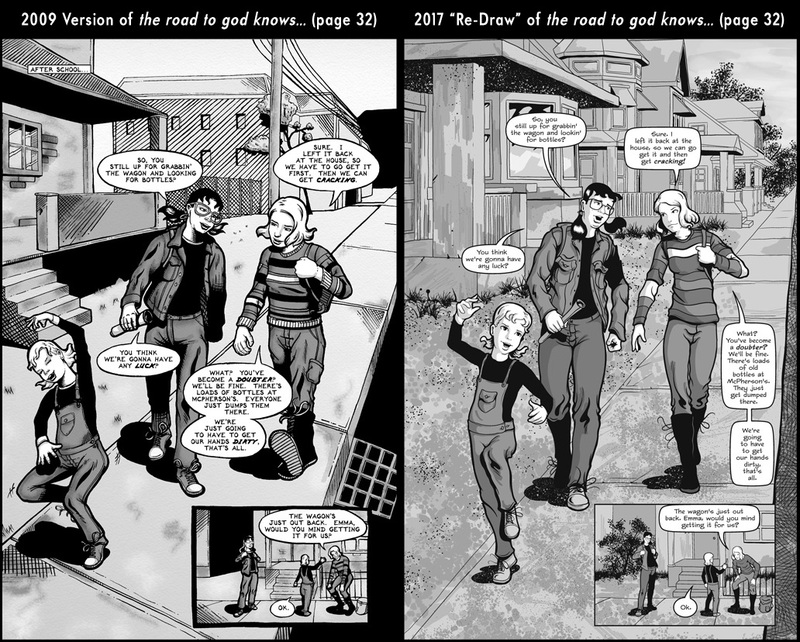 That may sound weird; I think it did with the folks involved in the film, but because the graphic novel was such a personal project for me and because my art had certainly improved quite a bit from back then, the idea of seeing that art in a documentary left me cold. So we worked out an interesting solution. 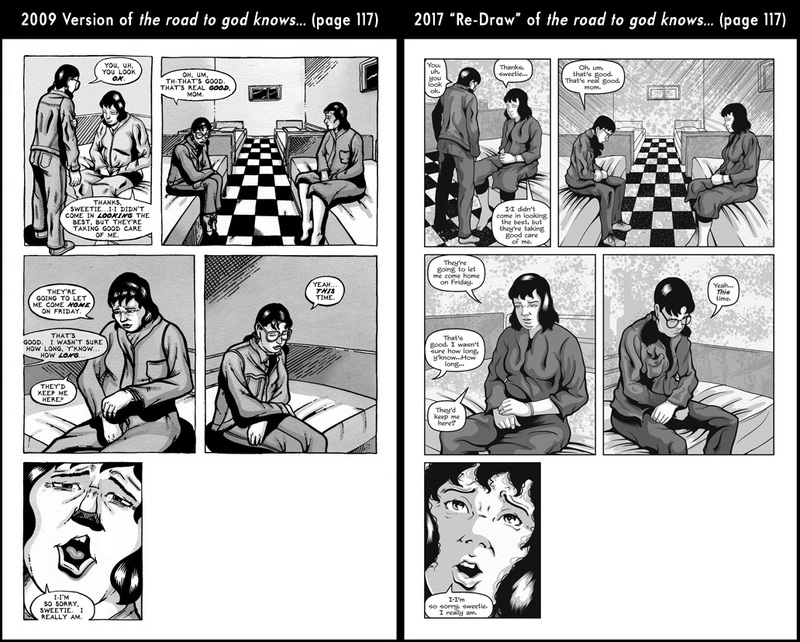 I would revisit road and redraw selected pages and panels from the graphic novel that Megan wanted to include in the film. As it turns out, that was one helluva big job. Some of the work was emotional; I was revisiting themes that in some ways I didn't want to revisit. For example, I was revisiting the death of my mom; the graphic novel is pretty autobiographical and while my mom died long before it was ever published, her presence is a big part of of the story for me. 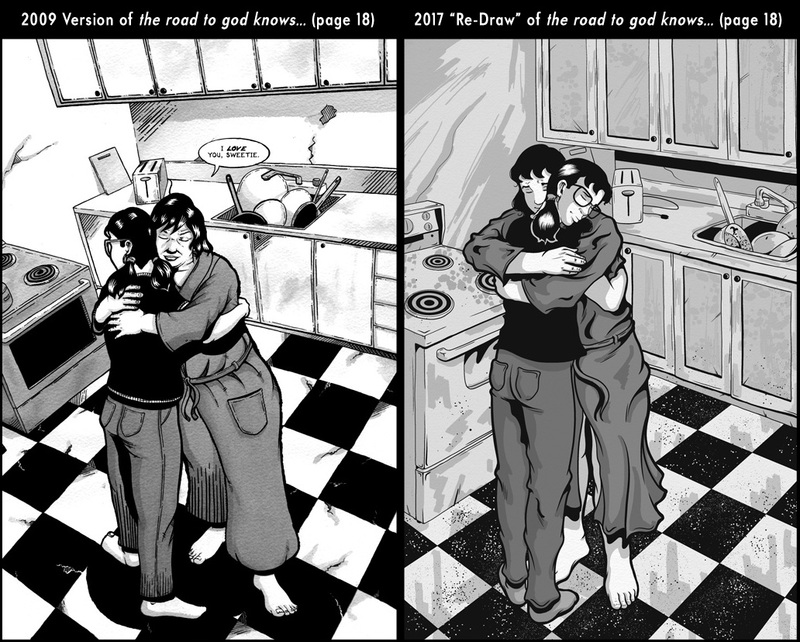 Some of the work was practical; in order to keep the pages similar, I had to stay pretty close to how I did things almost a decade ago, even though I would not necessarily write or draw the same way now. That wasn't easy; how I approach composition is different now. My thoughts on how a comic book page is put together is different now. How I write is different now. And on and on. Plus there was that pesky fact that the original art was pretty rough. I could use it as a guideline, really a very loose thumbnail, but that's it. I would have to draw most of it from scratch, as if it was a brand new story. 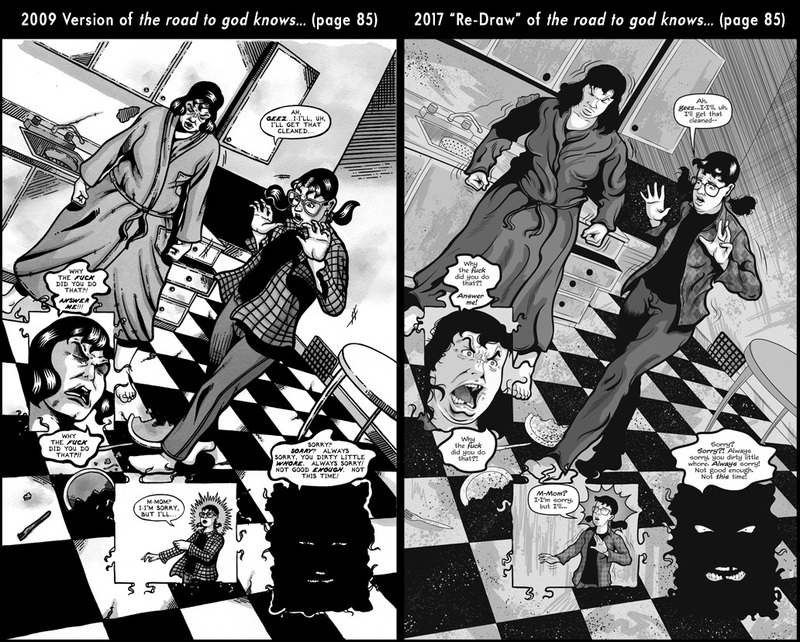 The actual redrawn art presented another problem. 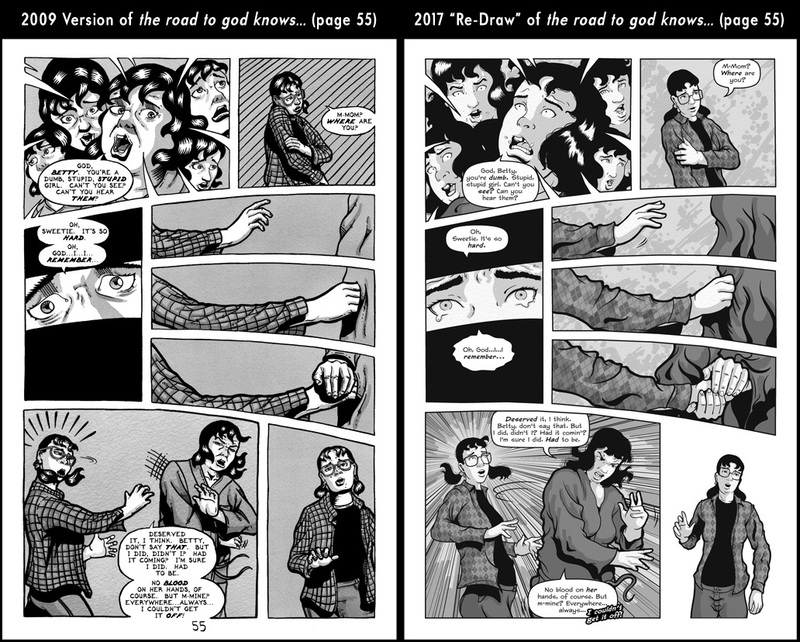 By redrawing the art, I could accidentally give the impression that the new art is what the graphic novel actually looks like. 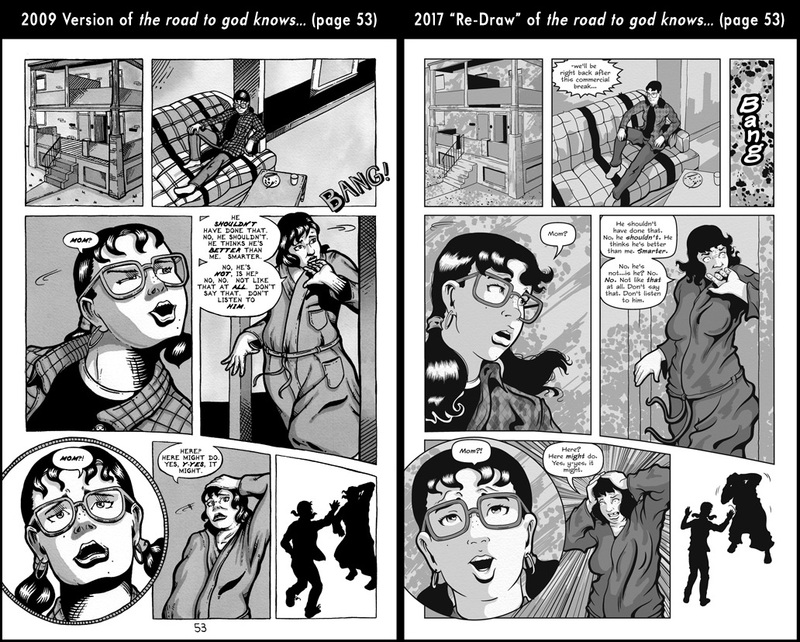 I felt a little sick when that dawned on me, so the solution was to avoid it completely by making the graphic novel out of print. I realize that there still a few copies “out there,” but it's fortunately not so easy to find and hopefully anyone who sees the documentary (along with the caveat about the art in the film credits) will understand. It's one of those weird situations that is almost counter-intuitive; in a way, the documentary will bring more attention to the road to god knows... then it ever had before. 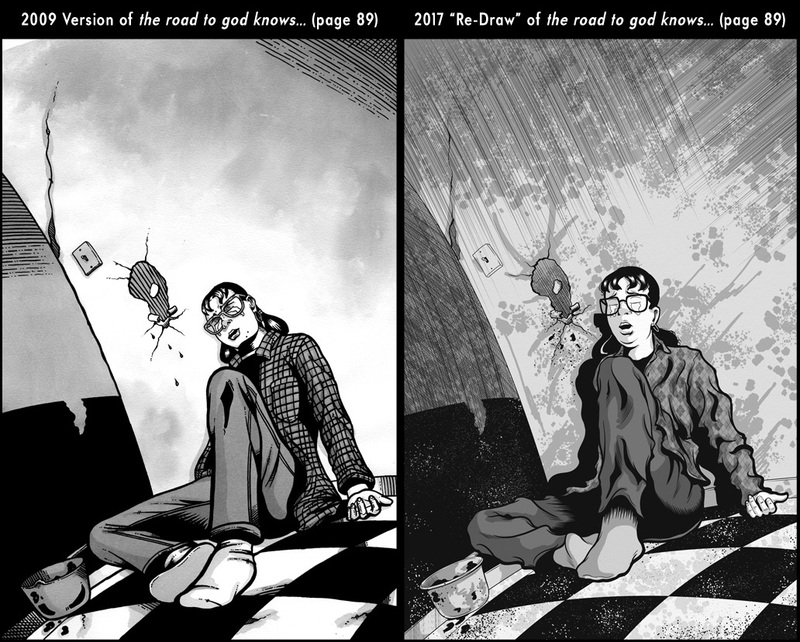 But to redraw the entire graphic novel (to “fix it” if you will) would be a monumental undertaking. Even with the redraws I did for the documentary, I only wound up touching something like 10% of the book. 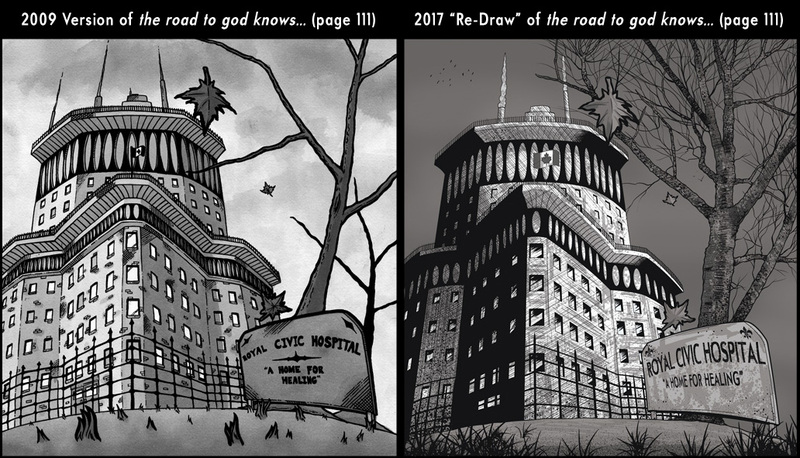 To redraw the rest would require...well, certainly a very keen and excited publisher. For me to do that other 90%? Nope. Tempting, but nope. I would rather move forward then go backward. 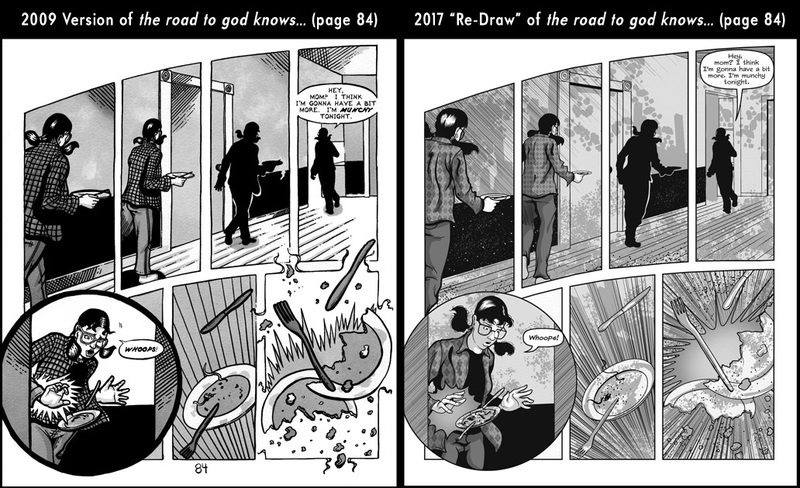 Given all that, the redraws represent an interesting and fairly poignant “what if.” What if I hadn't published the graphic novel when I did? 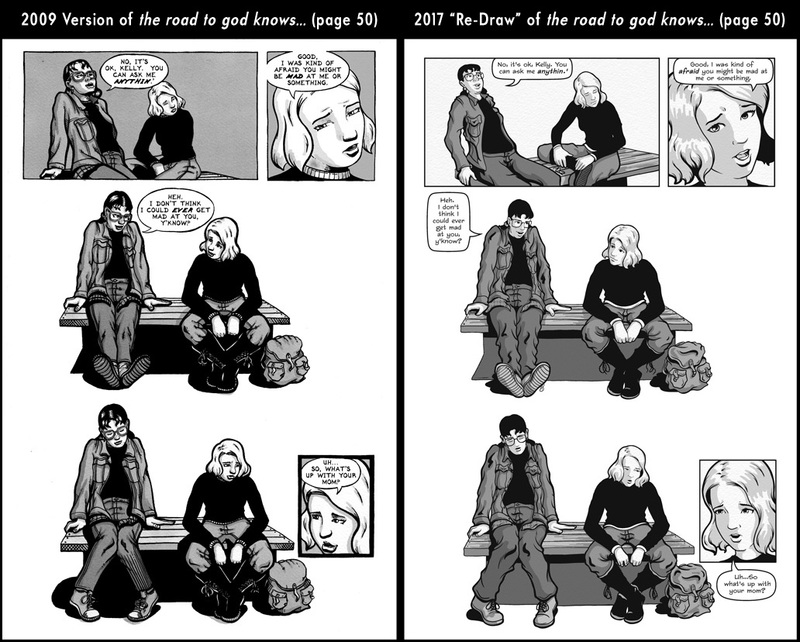 What if the entire graphic novel looked the way the redraws do? Would it have found a broader audience? Would it have found a publisher? What if? Ultimately, who knows? We learning by doing. I did the best work I could on the road to god knows... back in 2005-2009. That the work wasn't the best is unfortunate, but that's life. If I hadn't done it, would I have given up on art by now? Who knows? Do I regret doing it? No, but I'd be lying if I didn't say that I wish the art in the original version was stronger. It was hard to revisit on that point alone. You may note, by the by, that I don't say that I've gotten better. Better, in art and in life, is a judgment call that's difficult to make. Who's to say? What is better? But I know that I have gotten stronger. And that's enough. It is pretty amazing to find that road still touches people, enough to be included in a documentary almost eight years after it was published. Enough that the book is still talked about today. I occasionally get emails, like the one I received from Megan back in the spring of 2015. And, despite my misgivings, I'm happy the book keeps touching people, even in its rough form. And road, despite its flaws, taught me one thing. I love to draw. I wish I had found that out earlier, but I know it now. And that's not nothing. 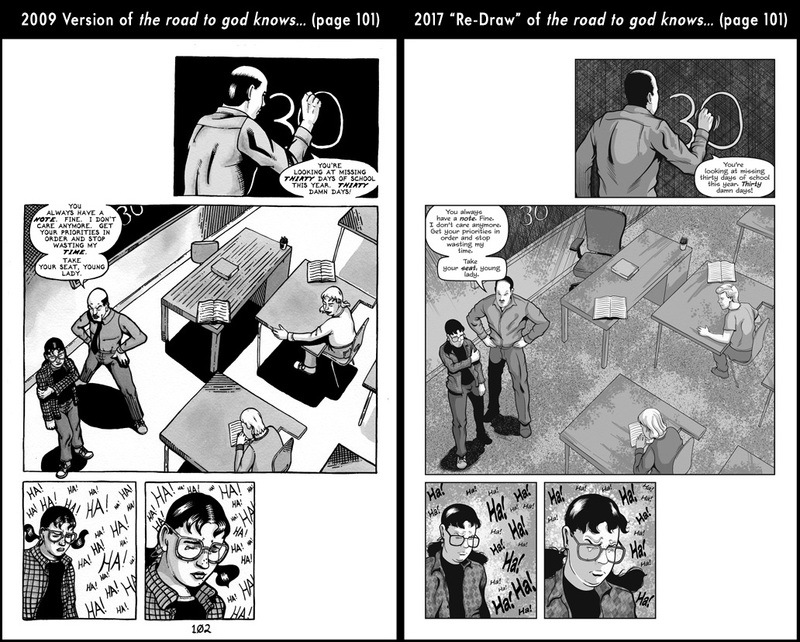 What follows are a series of images from the original published version of the road to god knows... and the re-draw versions. These are presented side by side, without further comment from me.